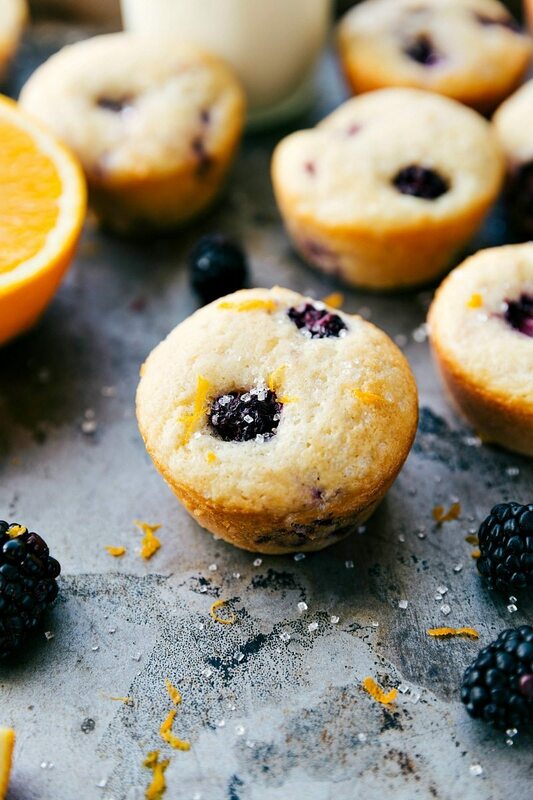 A healthier version of blackberry muffins with a hint of orange flavor. Lower sugar, added Greek yogurt, no butter, healthier oils, and all with NO sacrifice of flavor! 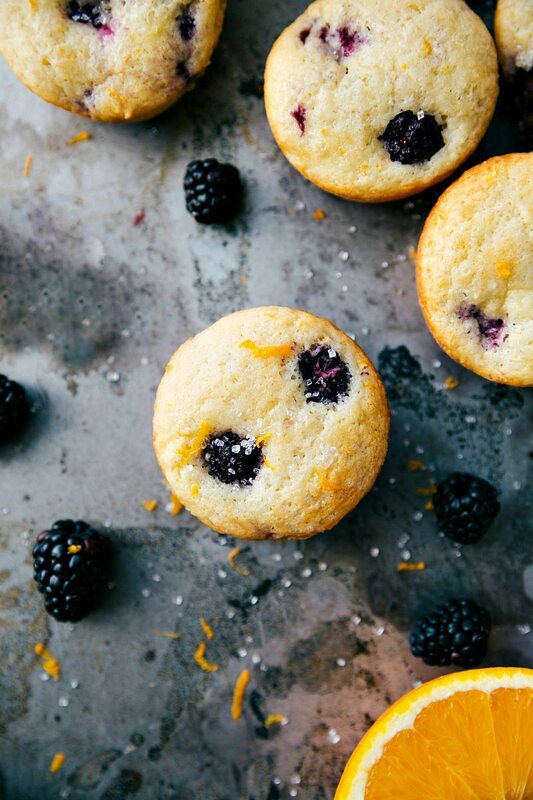 These “bakery-style” healthier blackberry muffins have been our go-to breakfast as of late! They are the perfect grab-and-go breakfast or healthy snack. And quite honestly, even a satisfying dessert! They are soft, tender, moist, and packed with flavor! Another fun thing about this recipe is it only makes 9 large muffins. The recipe doubles well if you want more, but with a regular batch (that makes 9) it’s perfect for a few days of breakfasts and/or snacks. And then none goes to waste (I don’t know about you, but if we have 12 or more around, we can never seem to finish them before they go bad)! Although these still have a fair amount of sugar, they also have Greek yogurt and coconut oil. Both are great healthy substitutions and still allow these muffins to shine as a “bakery style” type of muffin. 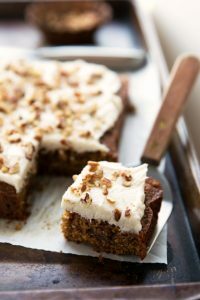 The “secret ingredient” in these are what makes them soft and have that bakery texture — cake flour! 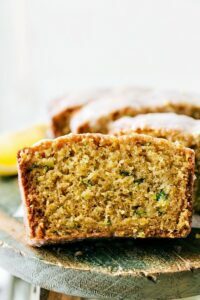 Cake flour is often an ingredient that bakery style muffins will call for, however, if you don’t bake a lot of cakes/muffins/breads it can be something to just sit in your pantry for ages. So instead of buying a whole bag of cake flour, an easy “hack” is to reduce the cup of flour by 1 tablespoon and mix in 1 tablespoon of cornstarch in it’s place. This is going to make these muffins super soft and give them a more moist texture. 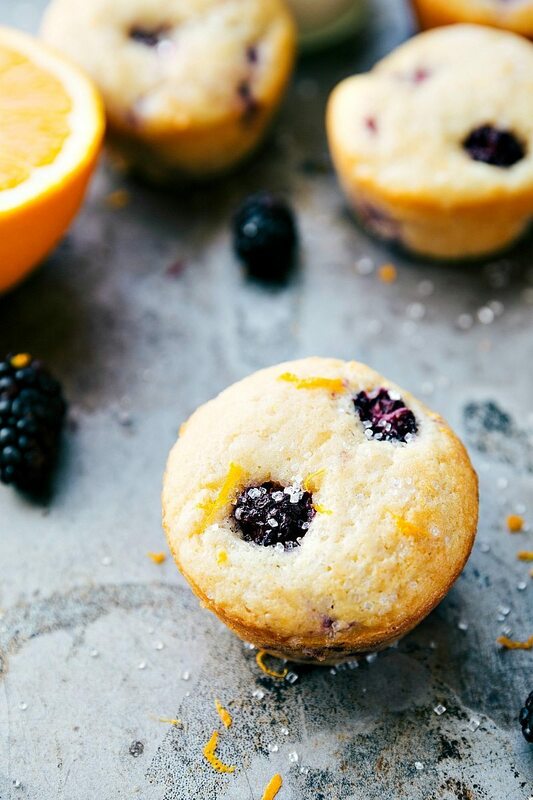 The orange zest ups the fruity flavor and enhances the flavor from the blackberries. 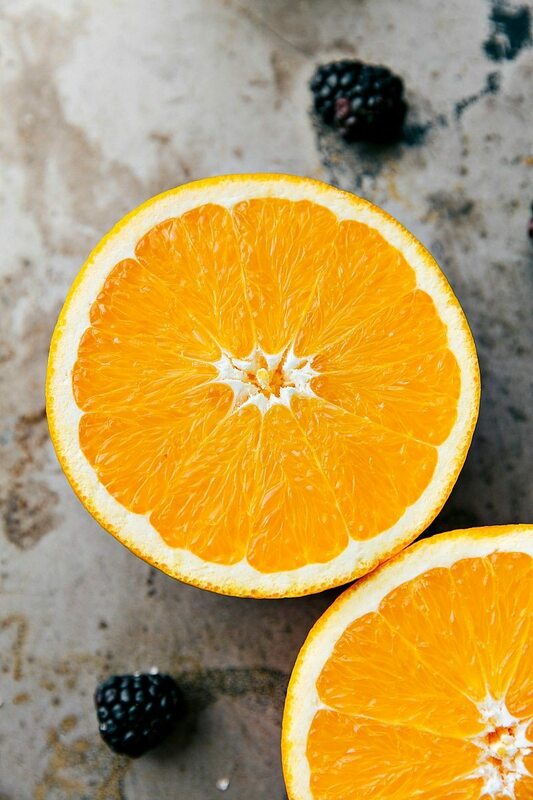 The zest of citrus is another common addition in bakery muffins! And finally, if you want a little extra “bakery style” goodness, add some coarse sprinkling sugar to the tops of these muffins right before baking them! Enjoy! Preheat the oven to 350 degrees F. Spray and lightly flour (do not use muffin liners as these stick) 9 of the muffin cavities and set aside. In a large bowl, add in the flour (Tip: when you measure the flour spoon flour into the measuring cup and then level the measurement so you don't pack in too much flour into the measuring cup; it should be a loose 1 cup). Add in the cornstarch, baking powder, and salt. Gently stir in the sliced blackberries until coated in the flour mixture and set aside. Stir in the zest of an orange, and sugar. Mix until smooth. Add the dry ingredients to the wet and mix until JUST combined. Over-mixing will yield less optimal results. Fill up the prepared muffin tin a little over 3/4ths the way full. The mixture should evenly fill 9 cavities. If desired, sprinkle a little bit of sprinkling sugar (1/4 teaspoon) on the tops. Bake for 20-25 minutes or until a fork, when inserted in the center, comes out clean. *I like the flavor of vanilla Greek yogurt best in these, but plain will work. 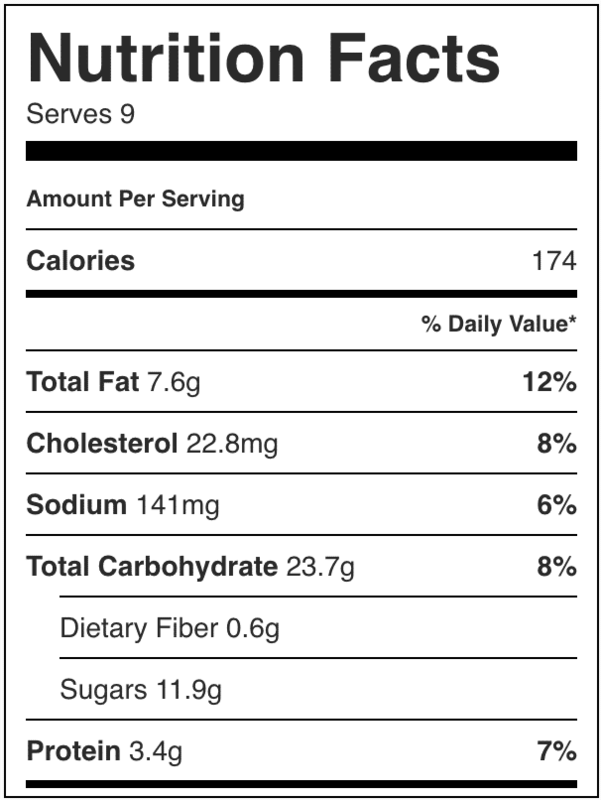 Do not substitute a non-Greek yogurt or low fat yogurt. I love it when I can trick the.boy into eating something healthy…and he has no idea! It’s the best. And it’s definitely an awesome litmus test for whether skinny things are actually good or are just “good for a skinny thing”. These look fabulous! Haha definitely the best 🙂 Thanks so much Joanne! Ohh, blackberries in muffins! Genius! The hubster LOVES blackberries…I am not a huge fan but I am always on the lookout for healthy on-the-go snacks or breakfasts for him! These look like they fit the bill perrrrrfectly! Thanks for this one lady! I love muffins for on the go breakfasts! What a great healthy muffin. Love that you used blackberries! Thanks so much for stopping by and for the comment Christin! Your hubby sounds a lot like mine. I can’t ever utter the words diet or low-fat or lightened-up or he’ll make a squishy-roll-the-eyes face. Little does he know, I feel him healthy stuff all the time! Hahaha!! This comment made me laugh so hard. I totally know the squishy-roll-the-eyes face all too well haha! 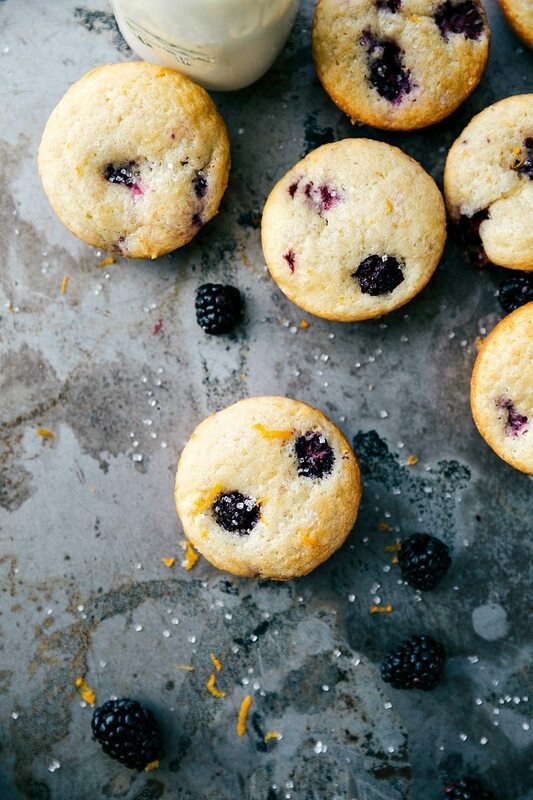 Love these blackberry muffins and the fact that they are a skinny recipe!! you had me at Skinny!!! Haha sounds like exactly what I do! 🙂 Thanks Kelly! these sound really yummy. i love blackberries! Hi Chelsea, I’m just stopping by via Saturday Night Fever. 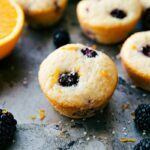 I really love your photos for this post they are light and bright and definitely make me want to go and bake a batch of these yummy blackberry muffins! Thanks for sharing. These muffins make me feel like it’s Summer, I love that feeling! Great looking muffins! These look delicious…thanks for sharing! Do you know the calorie count per muffin?? Oooh, these look so good! Thanks for linking up with What’s Cookin’ Wednesday! 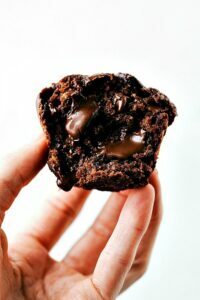 Muffins are my favorite breakfast food, and these look delicious! I love that they’re skinny, too. Thank you for linking to the In and Out of the Kitchen Link Party. Hope to see you next time. The part about making sure the blackberries are completely dry has thrown me. If all I have on hand is thawed blackberries, will it just be a total mess?? All your recipes are so sick.!!!!! They look super delicious. U ROCKKKKKKKK.